[important update] It appears that what I am mentioning at the end of the post is very serious, as far as I understand it Bauhaus is only a reseller and the French company is the actual creator of Mirage. The last version of Mirage available on Bahaus website is Mirage 1.5 which is not the newest release. The new release has been renamed TVPaint 8.1.1 (do you remember TVPaint?) and it offers features more suited for digital 2d animation. Buying from Bahaus will not allow you to upgrade to the new version and only TVPaint is intelMacs compatible. Here is the 2d animation software I am testing those days. I have been trying several since the begining of the month in order to improve my drawing skills and hopefully my animation skills and a better understanding on spacing. Just like every animation mentor students I tried PAP which seem to be the Zbrush of Digital 2d animation. An awfull interface that hides a software which only reveals himself once you get to know how it works. The drawing feeling is great but you can only draw in black or blue. The lack of coloring tool and only one layer just doesn’t do it for me so I tried Toon Boom. Toon Boom is a cool software because it offers a landscape mode timeline where you hold poses instead of just copying them. Copying is good but if you make changes you would prefer to see them reflected on the held poses instead of deleting them all and copying them back. One great thing too is that you can rotate the workspace. Now one thing that can put people off is the drawing mode. Toon Boom is a vector software so every paintstroke is interpreted in a clean mathematical manner. It is great if you love sharp looking animations with a finished feel to it but not so great if you are the kind of guy who needs to rough stuff up before hand. Next comes Mirage. I was reluctant at first because of the interface again but after few minutes and going through the various tutorials it doesn’t look so bad anymore and to animate you only need to know few things. I will either make a video very soon or a simple 2d animation tutorial to show you how it works. An animation toolbar is available but it doesnt’ look like it comes with the basic version of Mirage. Rusty Mills explains on his blog how he uses Mirage on his TabletPC (how long will I resist to buy a tabletPC…… ). 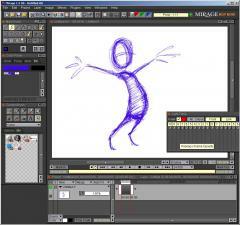 At the moment this is my favourite digital animation software. I use it everyday (few weeks left before the trial version expires) to do simple animation tests or sketch full poses, eyes and hand poses. My favourite tool is the size 3 blue crayon. I won’t encourage you to buy Mirage for the moment as there seem to be a legal issue between french company TV Paint and Mirage. 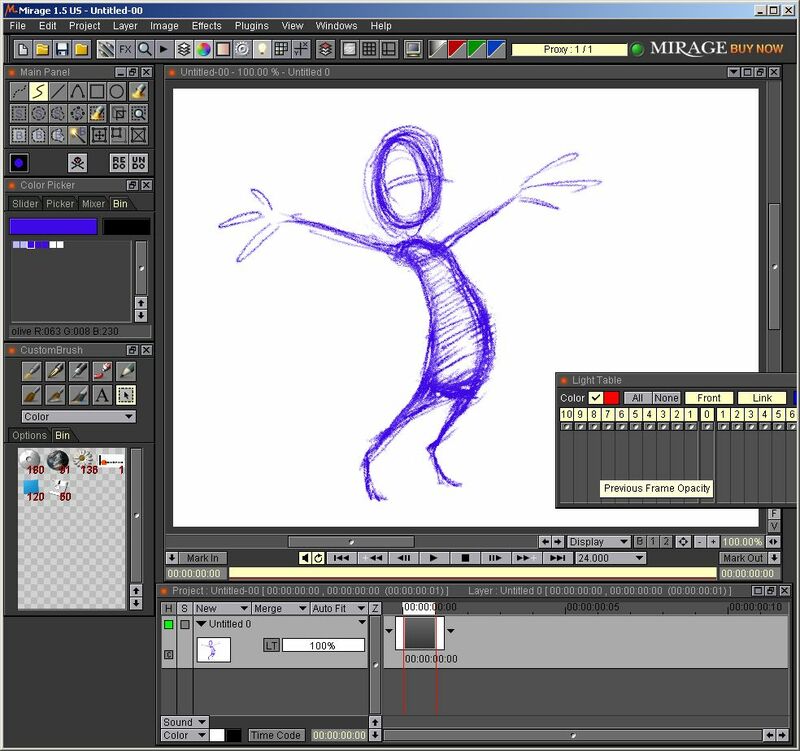 I don’t really know what is the whole story but TVpaint and Mirage are exactly the same software under a different name and color scheme (I have always prefered dark user interfaces though) .